Don’t trust anyone who doesn’t like candy. Candy brings out the kid in all of us and reminds us how to have fun again. Besides, an occasional indulgence is good for your health. Your doctor agrees. I checked. I’ve taken a week off for Christmas this year. The Plan is to decorate, wrap presents, listen to holiday tunes, dance with Daisy, eat cookies, visit with friends and family. I can just see the look of terror on my husband’s face as he pictures stacks and stacks of frosty cakes, cookies, brownies, candies piling up and taking over our house. Like me, he is a ferocious sweet-tooth. My Plan is going to challenge his efforts in training for an upcoming endurance mountain-bike race. The good thing is that most of it is going to leave the premises in the form of presents. Homemade treats are always the best gifts. They stand up against mass-produced, corporate conglomerate stuff. And while it’s true we work hard to earn the money we spend, anything made with care by hand, however imperfect, is extra-special. Old-fashioned sweets are the best. 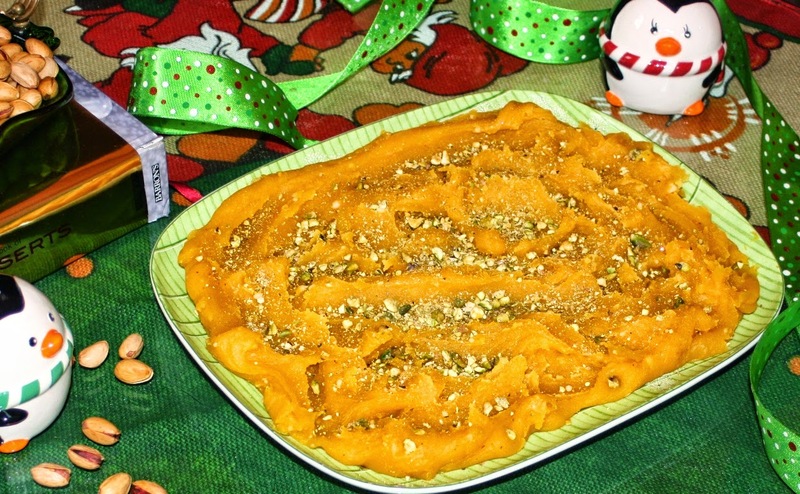 Halva is a time-honoured treat from the Middle East. Tracing its roots to old Arabia, halva has traveled miles and changed its shape, flavour, and consistency. 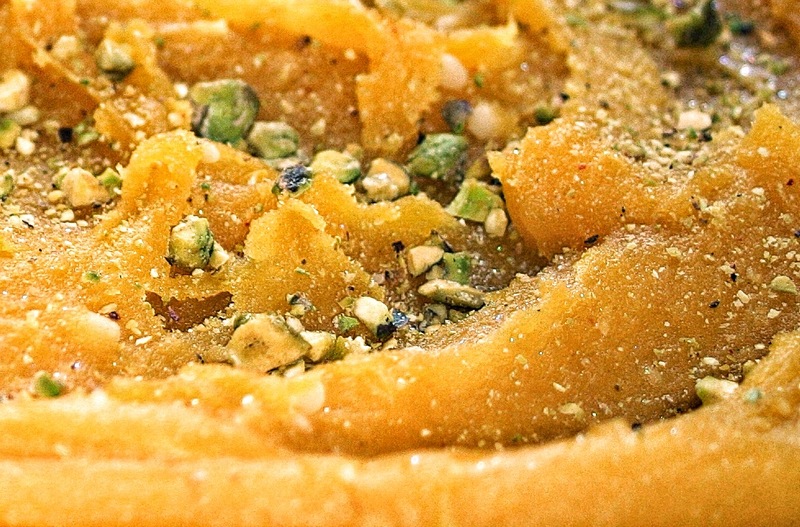 My favourite is a gooey, buttery, mildly sweet soft fudge scented with cardamom, saffron and rosewater, topped with a generous handful of crunchy pistachios. The recipe requires no special equipment or skill and takes no planning, because the ingredients are so basic. My grandmother used to make this for us. I can still see her standing at the stove, patiently pushing the flour back and forth, around the pan with a wooden spoon til the kitchen smelled toasty. It’s my new Christmas favourite, because it’s such an unexpected dessert. Edible glitter adds a subtle shimmer. Serve a big platter of it with fresh lavash bread and watch your guests’ eyes sparkle and shine. Note: This fudge can be made ahead of time and frozen in an air-tight container. Pour water into a heavy-bottomed pan, add sugar and stir until dissolved. Heat gently to make the syrup. Using a small mortar and pestle, crush saffron threads with a bit of sugar. Transfer to a mug, add a couple tablespoons of hot water, cover with a saucer and set aside to steep. In a large pan, mash soft butter into flour, add a smidge of ground cardamom and set onto medium heat. With a wooden spoon, stir the butter-flour mixture around the pan, heating it evenly until toasty and fragrant. The colour will darken slightly. 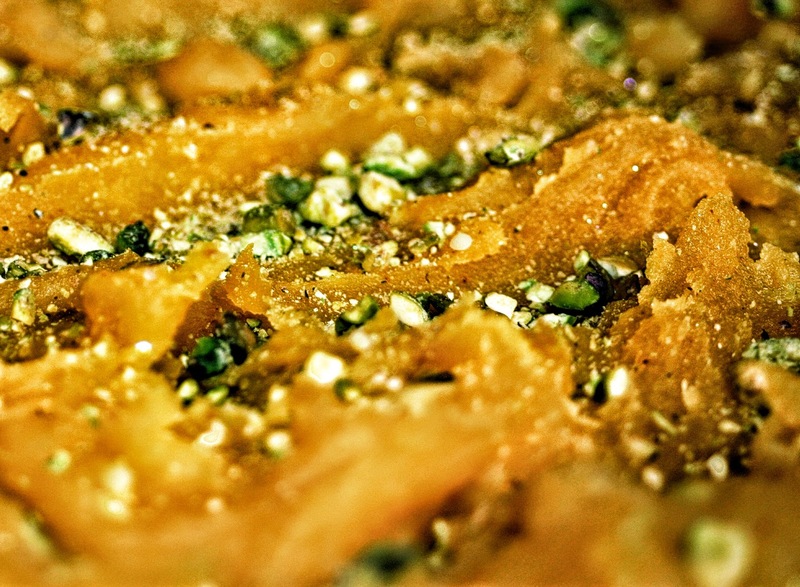 Add saffron to the syrup and pour over the flour-butter mixture, a bit at a time, and stir to incorporate well. Continue until all of the syrup is used and the fudge has thickened, another 5 minutes. Remove from heat. Allow the mixture to cool a bit, ~ 10 minutes. Add rose water and stir to combine. Transfer fudge to a pretty platter. Give the pistachios a good bashing and sprinkle over the fudge, along with a bit of edible glitter. Serve with fresh, soft lavash. This fudge has an exotic foreign accent. A gift from the Middle East that makes a statement. It says you’re a stylin’ world traveler with sophisticated taste, even if you haven’t ever left town. This fudge looks interesting! Are you interested to submit your post with Asian Food Fest, http://wendyinkk.blogspot.com.au/p/asian-food-fest.html which is Middle Eastern cuisine for Dec 2013 hosted by Shanon, http://www.justasdelish.com/asianfoodfest-west-asia/? They are my blogging friends from Malaysia. Before going… I like to wish you and your family a Marry Christmas and Happy 2014. Cheers! Very tempting! Halvas are very popular here, this would be perfect during winter season. Wishing you Merry Christmas & a very Happy New Year! I have never had this before, but it looks amazing! 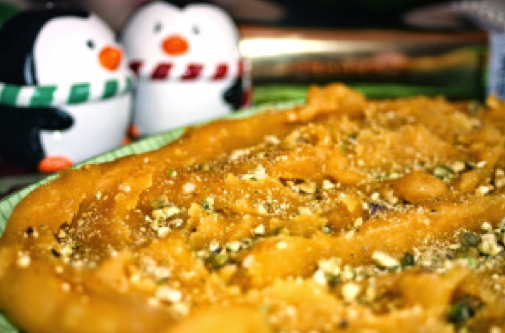 I would have never thought to add saffron to a sweet dish. I love this stuff! I was excited to see that you eat it with bread just like I like to do! It's sooooo good and yours looks perfect! Golden and glittery and the perfect present. I am sure everyone loved their gift. Hi, Zoe. Sure, would love it. Hope Santa brought you lots of goodies. Hope you guys had a wonderful Christmas. Hi, Kumar. Yes, saffron makes everything more decadent. Let me know if you make it. Cheers! Saffron is quite common in Middle Eastern desserts. Hope you try it, Laura. Yes, bread makes the halva taste even better, somehow! I am a big big fan of halva and this looks so good Colette. love the recipe, pinning it. Have a great year ahead, HAPPY NEW YEARS!! This is such a cool recipe. I love pistachio and I love saffron so this is perfect for me. I love halva and often make different kinds. I made flour halva before but my color never turns this orange-ish. I'll try your saffron steeping method next time. I love this with tortilla. Delicious.